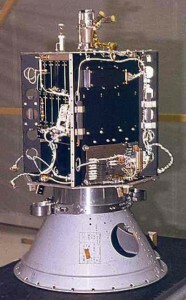 AO-7 (aka AMSAT-OSCAR 7) is the second Phase 2 amateur satellite launched into Low Earth Orbit on 15 November 1974. It remained operational until a battery failure in 1981. On 21 June 2002 the satellite was heard again on its 2 meter beacon (145.9775 MHz CW) after 21 years of silence, and 27 years in space. AMSAT reported AO-7 still semi-operational on 6 April 2006, with reliable power only from its solar panels; the report stated the cause of the outage was a short circuit in a battery and the restoration of service was due to its becoming an open circuit. The satellite eclipses on every orbit during the northern summer and autumn; the rest of the year it is in continuous sunlight and alternates between transmission modes A and B. The second repeater, constructed by AMSAT Deutschland e.V., AMSAT’s affiliate in Marbach, West Germany, is a 40-kHz* bandwidth linear repeater. It employs an 8-watt PEP power amplifier using the envelope elimination and restoration technique to maintain linear operation over a wide dynamic range with high efficiency. This repeater has an uplink from 432.125 to 432.175 MHz, and a downlink from 145.925 to 145.975 MHz. Since the uplink band in shared with the radiolocation service, an experimental pulse suppression circuit is incorporated in the repeater to reduce the effects of wideband pulsed radar interference in the uplink. Developmental versions of this repeater have flown in high-altitude balloon experiments in Germany, and aircraft flight tests of the repeater prototype unit. A 200 milliwatt telemetry beacon on 145.975′ provides telemetry data. Approximately So W.*eirp is required to produce 3 watts of repeater output at a range of 2,000 miles assuming.& polarization mismatch of 3 db. Sometimes when the satellite is in mode B, the CW beacon is active on 435.106MHz. After the classical HI HI 24 telemetry channels follow.